Glenglassaugh kommer nu med to Octaves aftapninger. Fadene er bygget af stave fra Bourbon, Pedro Ximénez, Oloroso, Amontillado Sherry og Port casks. Fad størrelsen er på 65 liter og modningen vil derfor foregå noget hurtigere end ved større fade. De to aftapninger er en peated og en non-peated (Classic) aftapning. Glenglassaugh Octaves Classic Batch 2 er udvalgt af Master Blender Rachel Barrie der har fundet octaves fade bygget af tidligere Bourbon, Pedro Ximénez og Amontillado Sherry fade. Aftapningen indeholder noter af "Waves of tropical fruit sweetness roll on the palate in balance with spiced coffee and an intriguing oak nuttiness." Classic Batch 2 er aftappet ved 44% alc. Glenglassaugh Octaves Peated Batch 2 har ligget på octaves bygget af tidligere Bourbon, Port og Oloroso Sherry Cask Octaves. Der er noter af "Salted caramel and yellow plum sweetness harmonise with savoury smoke and maple syrup, spiced by cask and sea." Peated Batch 2 er aftappet ved 44% alc. 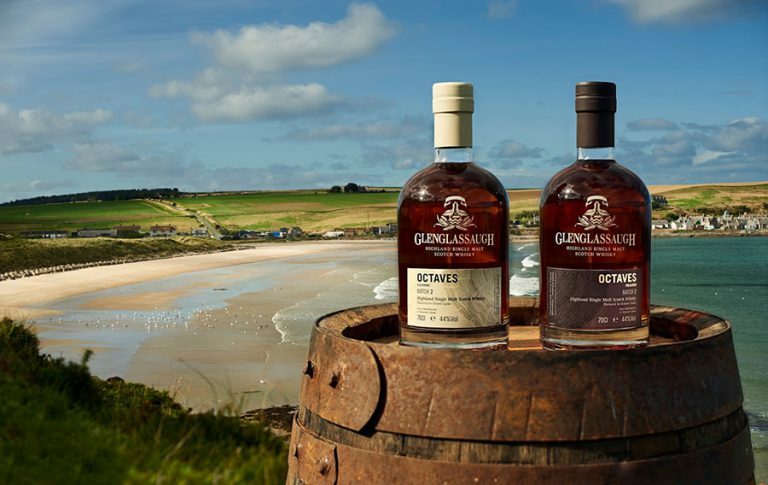 Glenglassaugh Master Blender Rachel Barrie siger: "As the surf rolls in on Sandend Bay and invigorating North Sea air passes through our coastal warehouses, these two luscious malts are truly a distillation of nature’s elements. Shaped by the rich abundance of land and sea, this fresh duo of Glenglassaugh Octaves encapsulate rolling waves of flavour that intensify and evolve with each and every sip. Glenglassaugh Octaves Classic and Peated Batch 2 are jewels in this elemental distillery’s journey, which I hope you will savour to the full."